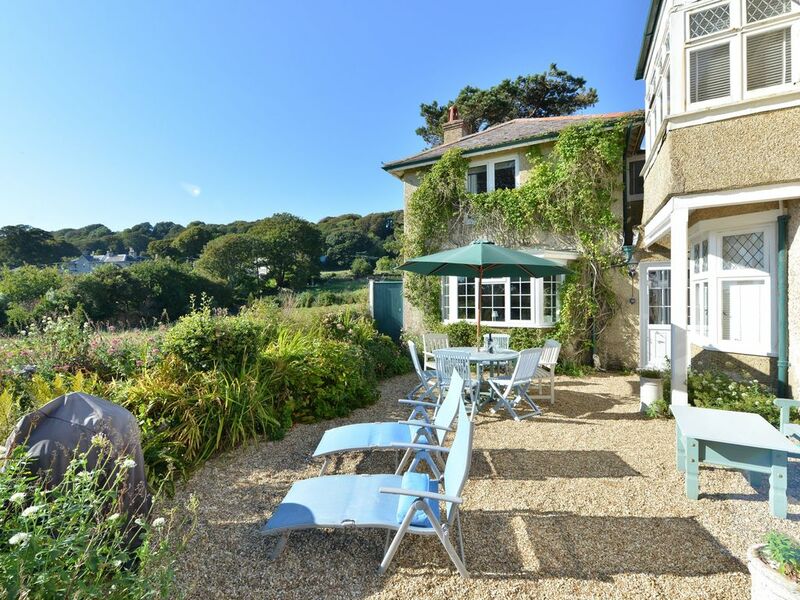 Once part of a hotel, this property has now been refurbished into a beautiful family home set within a peaceful and exclusive position offering stunning southerly sea views. Accessed over the driveway with ample parking, the accommodation offers comfortable furnishings and excellent facilities, including a living room with a woodburner, foosball table and far reaching sea and countryside views as well as a cottage style kitchen diner. Upstairs, there is a spacious interconnecting family suite with a double bed and twin beds as well as an ensuite bathroom in addition to a second double bedroom with an ensuite shower room. A rear garden with a barbeque and garden furniture provides the ideal setting for those summer evenings. It also has the unique benefit of direct access to the beach via the path through the garden and down Castlehaven Lane, ideal for dog walking, rock pooling and exploring. We simply love Pine Ridge. There is plenty of space and lots to entertain the kids. We walked down to the lighthouse again and found a cafe on the front. The Buddle Inn is very close, although we just made use of the well equipped kitchen. The weather was fantastic too! I am sure this will not be our final visit to Pine Ridge. Thank you so much for taking the time to put together such a lovely review. We're always thrilled to receive positive feedback and I will ensure your comments are passed onto the owner. We look forward to welcoming you back to Pine Ridge and the Isle of Wight soon! We have just returned from a week,our first, at Pine Ridge and we found it perfect. It was very comfortable,extremely clean, spacious,very well equipped and furnished to a high standard. It is situated in a great position in Niton with pubs,shops and walks within easy walking distance. Martin and Sue, the very friendly owners, are on hand if you need help with anything or want advice on walks, eating out etc, but they weren't intrusive. We would definitely recommend staying here, and hope to return ourselves. Thank you, Martin and Sue, for allowing us to stay in your super holiday home! A most enjoyable stay. A peaceful location with scenic views and a short walk to the coast. The owners were very helpful and friendly. It was really useful having some necessities such as soap, dishwasher tablets, rubber gloves etc. Would recommend. Thank you so much for taking the time to put together such a lovely review. We're always thrilled to receive positive feedback and I will ensure your comments are passed onto the owner. We look forward to welcoming you back to Littlestairs and the Isle of Wight soon! We were there as a family of 5, family of 4 with children aged 3 & 6 and grandmother, the house was perfect for us with separate bedroom areas and bathrooms, lots of room in the well laid out living areas. Sea view and views over the fields, we even had a visit from a red squirrel! Close enough to Blackgang Chine to pop there for a couple of hours. We also visited the beach, Carisbrook Castle and a donkey sanctuary , it was hard to choose what we wanted to do in the time we had. All in all a wonderful holiday! Thank you so much for taking the time to put together such a lovely review. We're so pleased to hear you thoroughly enjoyed your stay. We look forward to welcoming you back to Pine Ridge and the Isle of Wight soon! The cottage was very comfortable, spacious and everythingg we needed for a relaxing holiday. The beds very comfortable and the and the rooms light and airy. The views from all aspects were spectacular, fields with sheep and alpacas , sea views and pretty countryside. The garden was big enough to sit out and relax or have a barbecue. Walking distance to a small bay called Reeth Bay with sandy beach, the Buddle pub and St Catherine's lighthouse. The owners were helpful and there if you need to know anything. St. Lawrence is a small village situated along the famed and beautiful Undercliff, a designated Area of Outstanding Natural Beauty on the south facing coast between Niton village and Ventnor. There is a Post Office/general convenience store as well as a 13th Century church, considered the smallest in England. Nearby coastal paths will take you to Binnel Bay, Woody Bay and beyond. Nearby Niton Village has plenty of shops and is a surprisingly well appointed village; it is home to several churches, a pottery workshop and local shops. The lower part of the village, below the cliff, is known as &lsquo;Niton Undercliff' and was a small fishing hamlet in the 19th century. This includes the most southerly part of the Isle of Wight, St Catherine's Point and St Catherine's Lighthouse built in 1840. There is a popular pub in the village and a 16th century Smugglers Inn near the Lighthouse called &lsquo;The Buddle'; this award winning inn serves great food and has open fires, flagstone floors and beamed ceilings. Niton also provides easy access to the unspoilt &lsquo;Back of the Wight' coastline, beaches and coves. The Isle of Wight is famous for its superb beaches, dramatic coastlines and outstanding natural beauty, making it a holiday haven with something for everyone. From secluded coves and wide expanses of sandy beaches to coastal paths and woodland, it's not just the stunning landscapes that attract visitors to the island, but also the variety of things to see and do. Rich in a wide variety of sporting and leisure activities, it's no wonder visitors return year after year. Self-catering is the most popular option because it is both cost effective and offers the flexibility and freedom to come and go as you please. Electric, heating & hot water included in the price; Bed linen and towels provided. Please bring your own beach towels; Pets are not permitted; Non smoking accommodation; Walking distance to the beach; Niton village half a mile away; Short breaks available, minimum 3 night stays (off peak only).